Back pain is a common condition that usually relieve by going for a Trigger Point Massage Therapy. Depending on severity of the pain the massage therapist can help you heal in just one or two treatment. 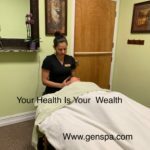 Massage therapy can help to loosen it up the muscles and reactivates the blood flow to flow back into the effected area to bring restoration and healing. It could be caused by sleeping in an awkward position, having bad posture, or even by a minor injury. “Ultimately, lower back pain is most often caused by either overuse and poor muscle strength, a herniated disk or some other degeneration of the vertebrae. Once massage is done we suggest to stay active and do exercise. The best way to strengthen the muscles is by regularly doing rowing swimming-is the “perfect” exercise for people that often develop back pain. It’s a low impact sport that reduces stress and discomfort on the spine. It also helps to encourage blood flow to the back while using a number of different muscles movement.